If I measure my summer by canning jars, I’m up to 33. I made a no sugar added apple-cherry cider jelly in mid-July with cider from my Farm Share. Late July brought a jug of apple-apricot juice and I made no sugar added jelly out of that too. Finally, my first preserving share item arrived, sour cherries! I had been waiting anxiously for those cherries with a bottle of amaretto and package of pectin in hand. A preserving share is just one of many share types offered by local farms. A little research of the farms in your area may unearth vegetable shares, fruit shares, bread shares, cheese shares and even mushroom shares! Egg shares guarantee you a dozen fresh local eggs every week. As a person with a beloved flock of pet chickens, I highly recommend those egg shares. Chances are the birds on your local farm enjoy a life much better suited to a chicken than those who lay the eggs found in the grocery store. Accordingly, their eggs taste better and bring you more nutrition. The preserving share secures a larger amount of specific items in the harvest. I chose five fruits and vegetables, with 12 lbs. of sour cherries being the first to arrive. Later in the season I expect to get peaches, apples, tomatoes and spinach. I’ll can them and we’ll be able to eat local all winter! 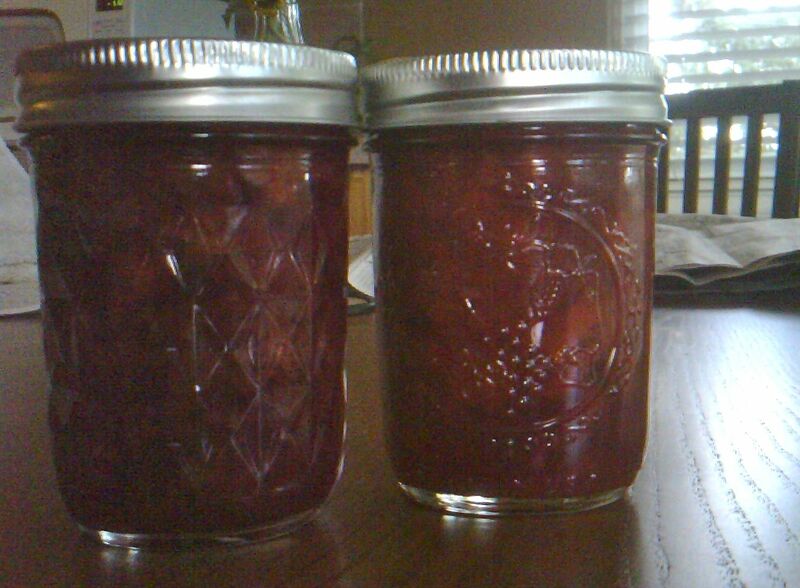 I made cherry-amaretto jam out of the sour cherries, using the recipe below. Since I prefer foods that taste more sour than sweet, I reduced the sugar to 2 cups and used low-sugar pectin. You don’t have to can the jam, but if you do be sure to follow accepted canning practices (and note that Ball recommends following the recipe exactly, something I did not do). Jam can be stored in the refrigerator or freezer, and if my house is any indication, it won’t last long anyway. We ate it over vanilla ice cream and mixed it into plain yogurt. Finely chop cherries. Combine cherries, powdered pectin, almond liqueur and lemon juice in a large saucepot. Bring to a boil, stirring frequently. Add sugar, stirring until dissolved. Return to a rolling boil. Boil hard 1 minute, stirring constantly. Remove from heat. Skim foam if necessary. If canning, ladle hot jam into jars, leaving 1/4 inch headspace. Adjust two-piece caps. Process 10 minutes in a boiling water canner, adjusting for altitude. Bonnie – there is something about canning jams and pickles that has always been strangely mysterious to me. I love the idea of the “shares” sort of like holiday cookie parties!